Time may heal all wounds, but 10 Second EM for Android can help you make intelligent decisions about acute problems seen in the ED and elsewhere. This app can mean the difference between sending a patient out the door vs. getting a CT scan. It can save crucial seconds off an ACLS code, and it can be a lifesaver when determining correct drug dosages, the likelihood that a patient has a PE, or the severity of a patient’s chest pain…IF you know what you’re trying to find in the app. 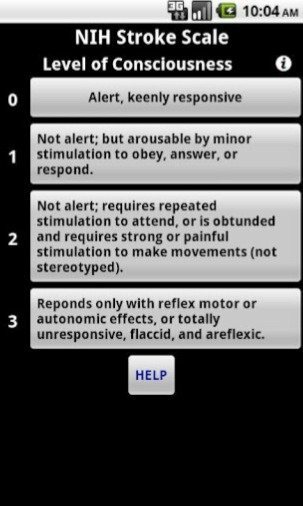 And most importantly, the app is pointless unless you have a good fund of baseline knowledge in Emergency Medicine. 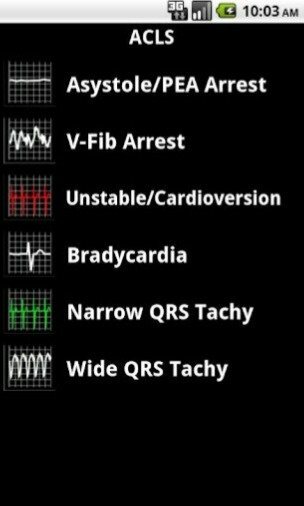 10 Second EM is a set of medical reference tools, organized by body systems and important EM topics. It is designed by Gladiator EM, a company started by an emergency medicine physician. As such, it is geared toward the emergency setting, but I found the app quite useful in other settings as well, including family practice. There are certainly a wide range of topics included, as shown in the opening screenshot and the image below. 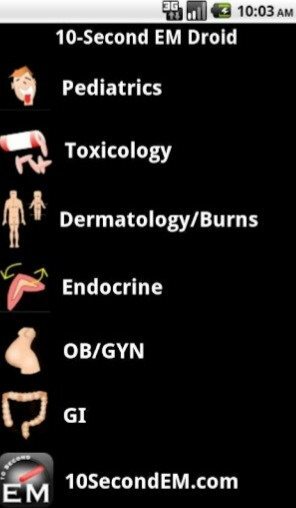 Some topics, such as cardiology, pulmonary, and pediatrics, have a very large amount of clinical tools. However, other topics such as GI and endocrine have very little information contained within. As a result, I feel that this app would be better suited to broader specialties (EM, family medicine, and pediatrics) than more specific specialties. The ACLS Algorithms are especially useful, and these alone would probably be worth the purchase price for anyone participating as part of an inpatient code team. ACLS protocol is described for each of the cardiac rhythms shown in the picture below. A code timer is also included, beeping every two minutes for 20 minutes. However, the user cannot exit the timer page or the timer stops. 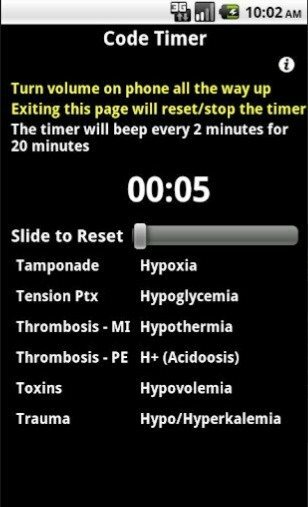 Therefore, the wonderful ACLS protocols are inaccessible during any code that the timer is used for. For me, this made the code timer essentially useless. Most of the other tools within the app are very well done, providing information that can supplement the clinical decision-making process. Many have interactive algorithms, such as the NIH stroke scale pictured below, allowing the user to select one answer before moving on to another component of the algorithm. Others are simply a screen showing pertinent information, with no provision for input from the user. I still find these screens useful, since much of this information is hard to memorize. Some screens have small typos or grammatical errors — which is concerning and should make physician users more caution of using the content for patient care — again, if you don’t have a good fund of baseline knowledge, this app most likely isn’t for you. Now we must talk about one of the main reasons against selecting this app for use. It is not as easy to use as one might think. It actually takes quite a bit of work on the part of the user to know what is contained in the app and when to use it, since it does not contain an exhaustive list of all possible clinical tools and a description of the use of these tools is often lacking. It took me probably an hour, spaced over a period of a week or so, to really know what was in the app. Only then can it truly be called “10 Second EM” and not “2 minute EM.” If you do not want to take the time to get to know the app, you will find yourself constantly looking for something that isn’t there. For example, I was looking for Light’s Criteria for a lady with bilateral pleural effusions, thinking that it would be easily accessible in the app when it really was not even included. The developers made a search feature, which takes some of this guessing away, but your search criteria must be in the title of the topic you are looking for–otherwise it won’t appear. You cannot type “myocardial infarction” and expect to get any results. Instead, you must type “NSTEMI” or even “MI” to find what you’re looking for. A nice feature, but I would have liked to see the use of keywords in the search feature, which would really help users unfamiliar with everything the app contains. A favorites list would also be useful, especially if individuals only find themselves using certain tools over and over again. I find myself not using the app every day, but when I know that I can use it, it does save time and provides helpful information. I am crossing my fingers that the developers give us some updates in the near future, providing us with even more clinical tools to choose from. This is a solid, affordable app for medical professionals and students alike, with a wide range of covered topics at the user’s disposal.